Rich in fiber and essential fatty acids, chia seeds make a smart addition to your diet. Learn more about this superfood and how it can help you. Anti-aging treatment, weight loss agent and digestive aide -- these are just some of the reasons why chia seeds have become a superfood. Chia seeds come from the plant Salvia hispanica, a flowering member of the mint family, Lamiaceae. Chia are native to central and southern Mexico as well as Guatemala. The small seeds have long been harvested as a nutritious food source for their omega-3s as well as minerals like calcium and potassium. Dr. Mehmet Oz also drew attention to these tiny, power-packed seeds on his popular show, "Dr. Oz," in 2011. Omega-3s are an essential part of a healthy diet. Omega-3s can decrease the risk of heart attack and improve mental health. Chia seeds remain the most highly concentrated plant source of omega-3s, which make them a great alternative to eating fish or taking fish oil supplements. Chia seeds are full of antioxidants, which fight free radicals in your body. Free radicals come from environmental factors such as pollution or ultraviolet light from the sun that cause your body stress. This stress can cause your skin to wrinkle, a common sign of aging. Eating chia seeds or taking them as a supplement, can help you increase the amount of antioxidants in your body to blast free radicals, keeping them from wreaking havoc on your skin. Fiber is necessary for regularity, but factors like a hectic lifestyle can keep you from eating the most healthy, fiber-rich foods. A lack of regular bowel movements can lead to gastrointestinal problems, like diverticulosis. 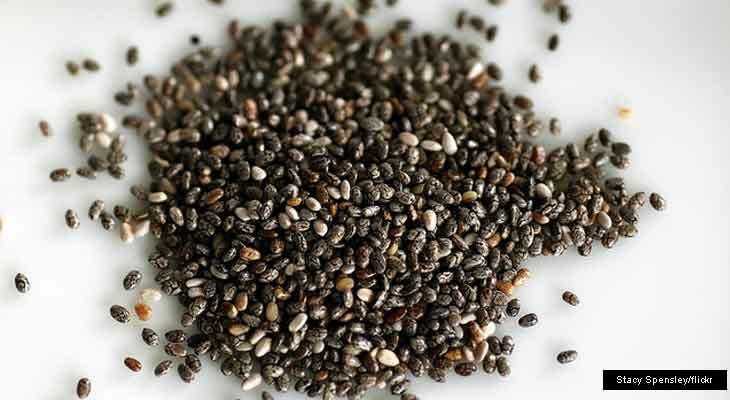 Chia seeds are made up of soluble and insoluble fiber. Soluble fibers react in your body as gel, which helps ease toxins through the digestive tract, so you have regular bowel movements. Insoluble fiber aids in digestion, helping the food breakdown easier in the stomach to make its way out of your body. The fiber in chia seeds has is also a source of energy. Since the soluble fiber turns to a gel in your stomach, it takes longer to breakdown, remaining in the body as an energy source and preventing the common "crash" hours after eating. The high amount of protein in the seeds also fuels your muscles to keep you in motion longer. If you’re dieting, you know how important fiber is. Fiber helps you feel full longer, allowing you to cut back on your food consumption. After taking chia seeds, the soluble fiber expands as a gel in your stomach, occupying space, which signals to your brain your stomach is full. As your body slowly breaks down the contents of your stomach, your urge to snack between meals is decreased. The added protein in chia seeds provides you with the energy to get through your exercise routine, helping you stay on track and burn more calories. By supplying your body with a constant, steady supply of energy, chia seeds can help regulate blood glucose levels -- a possible solution for those with diabetes looking for healthy ways to maintain ideal blood sugar levels. People all over the world add chia seeds to prepared meals or eat them raw, like nuts. If you don’t want to include the actual seeds in your regular diet, you can receive the same benefits taking chia seed supplements daily with meals. This powerful multivitamin contains a blend of whole foods, all rich in fatty acids, including chia! each serving provides 35 mg of omega-3s and a total of 85 mgs of fatty acids. This multivitamin goes beyond the basics for a complete supplement to help you look and feel your best. This seed meal from Now can be easily added to food as a way to boost fiber and protein content. This product also provides essential acids, including omega 3, as well as vitamins and minerals.